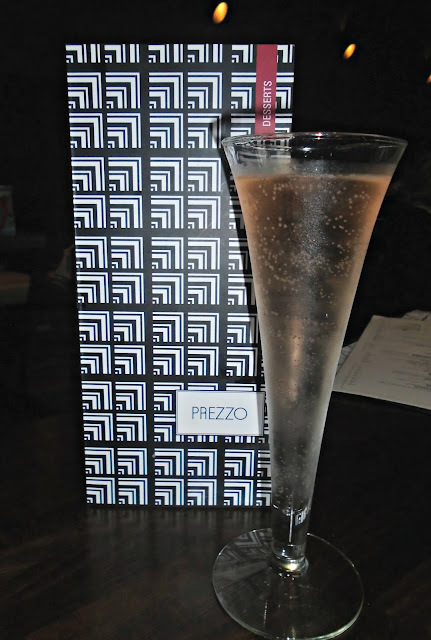 We were recently invited along to enjoy a family meal at our local Prezzo restaurant in Bristol, having never tried it I was really excited to visit having taken a glance at the menu! 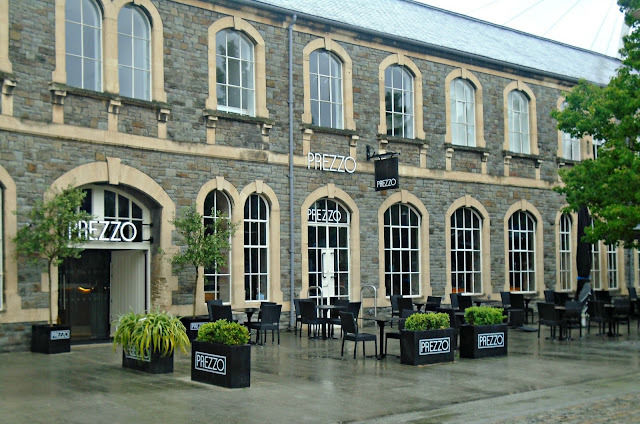 Despite the weather making it wet and rainy outside stepping inside Prezzo instantly changed our mood. The atmosphere was welcoming and lively and the building with its high ceilings and classic yet modern decor and huge windows was beautiful. The building is beautiful and upon arrival you are greeted by the sight of the open kitchen with amazing aromas coming from the pizza oven in the centre which was lovely to see. We were quickly greeted upon arrival and shown to our table which was a cosy booth style area situated near a large window looking out in to Bristol. We were given menu's and shortly after our waitress came over to offer drinks. 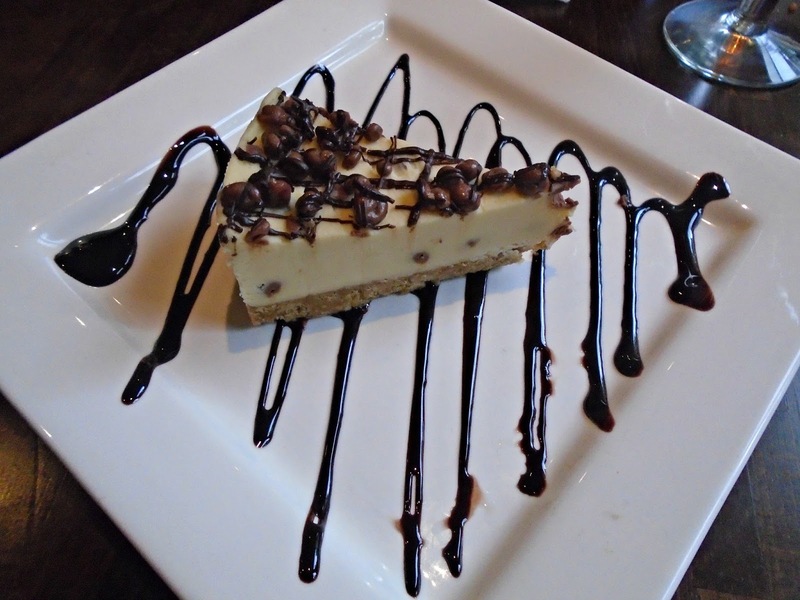 The service was attentive and very quick, I would have liked a little more time to look at our menu before ordering drinks etc preferably however it didn't impact on us and it was lovely to not have to wait to long for a drink upon arrival. There is plenty on offer on the Prezzo menu and after seeing the starters menu we had to give them a try! We ordered the Baked Mushrooms which are mushrooms Stuffed with bella lodi cheese and mozzarella cheese, garlic, onion and breadcrumbs and served with garlic mayonnaise. I can confirm these are so delicious both me and my husband thoroughly enjoyed them. We also had the Large Pane Con Cipolla which is a huge Garlic pizza bread topped with balsamic onions and mozzarella and we added goats cheese too. Again this was absolutely delicious and the melted cheese with a golden top and crispy super thin base made it extremely mourish!. We then moved on the the extensive main menu offering so many choices of Pizza and Pasta you are sure to find something you like. If pizza and pasta are not your thing though there are also a few other things on the menu including the Italian Burgers my husband chose. The Italian burgers consisted of Two burgers – one with crispy prosciutto and smoked scamorza, the other with mozzarella and pesto, both served in a fennel, black onion and sesame seed bun, with garlic mayonnaise, lettuce, tomato and red onion. These got the big thumbs up from my husband who said they were so juicy and packed full of flavour. I had heard so many great things about the pizza at Prezzo I just had to try one so I went for the Tre Gusti V-I-Pizza and it was absolutely delicious and absolutely humongous! This pizza could have very easily been shared by 2 people it was so big. The Tre Gusti pizza features Pepperoni, seasoned chicken, pancetta, rosemary, mozzarella and tomato which were all generously applied to the top of my pizza. It tasted fresh and full of flavour and I was very pleased with my choice. 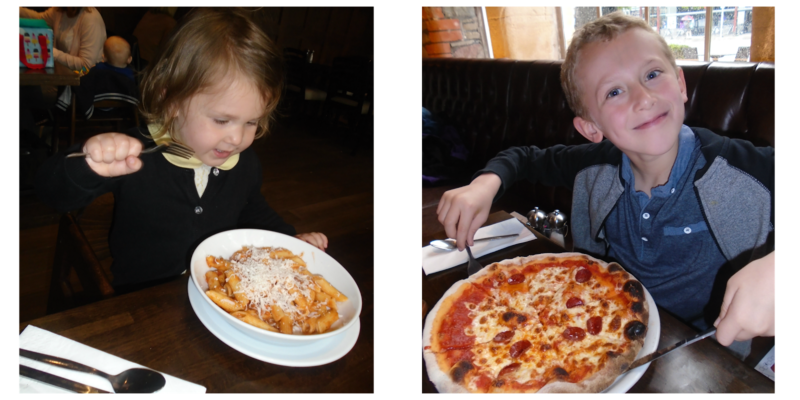 Prezzo also have a very cute kids menu with a select few dishes on especially for the kids. They have two types of kids menus one for toddlers and one for bigger kids which I thought was fab, especially as we took Evelyn and she isn't a huge eater so the toddler menu portions were perfect for her. 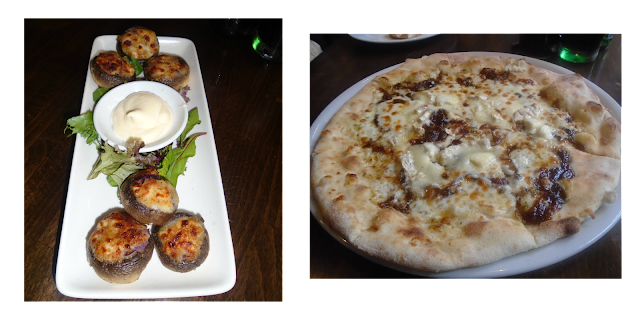 Both James and Evelyn chose the garlic bread starter from their menus and both ate it all so it must have been good. James then chose the pizza for main and chose pepperoni for his topping (they can chose from pepperoni, mushrooms or pineapple). Evelyn had the penne pasta with a bolognaise style sauce which she loved, I don't think I've ever seen her tuck in to something so quickly! After all our food we weren't sure if we would have room for pudding, however one glimpse at the mouth watering menu and we were sold! Both myself and my husband had the honeycomb smash cheesecake which was creamy, chocolatey and scrumptious, I would have loved a little more of a honeycomb taste to it though. James chose the nutella and banana mini calzone which was served with a scoop of ice cream, James said it looked and tasted like a pancake and was very yummy with the oozing chocolate and warm banana inside. Evelyn had a fresh fruit strawberry lolly and I loved that they had something smaller and refreshing like this available after a pretty heavy meal for a especially for a toddler. We finished of our meal with a drink and let the kids finish the colouring sheets they had been given upon arrival (big thumbs up for these as they definitely kept the kids entertained between courses!). We didn't feel rushed whilst we enjoyed our drinks and the staff ensured our table was kept cleared of empty drinks the whole time we were there. The waitresses were so friendly and even took time to speak to Evelyn when she was getting a little grumpy towards the end which was so lovely to see. If you love Italian food Prezzo is the place to be its relaxed friendly atmosphere makes for an ideal setting whether its a romantic meal, gathering with friends or just a family meal out you are looking for. Staff are friendly and attentive and the food gets a huge thumbs up from us. Have you ever been to Prezzo? What is your favourite meal there? **I was not paid for this post, We received a complimentary meal, I then wrote this honest review. I love the pizza at Prezzo. In fact your post has reminded me I haven't been there in a while. 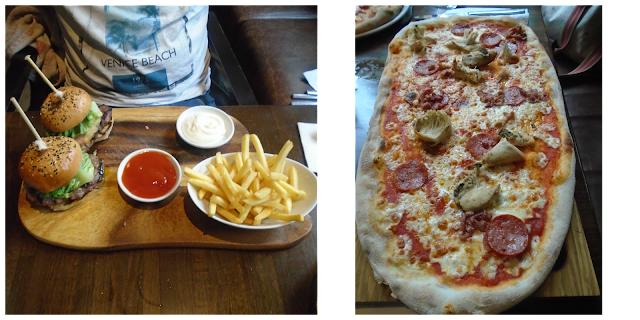 I love the food at Prezzo, must pop in for another meal again soon! I love Prezzo and they often have deals on (it's worth signing up to the emails). Truffle fries were the highlight of my last meal there. Free Prosecco on your birthday is a winner too!